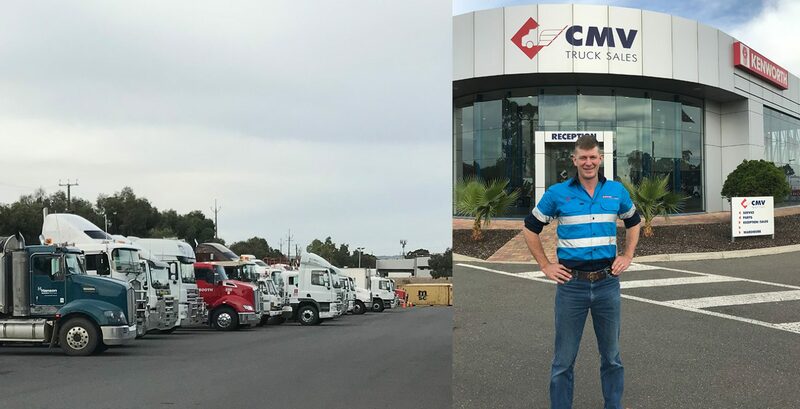 Our Dealer of the Month is CMV Truck Sales and Service Pty Ltd.
We talk with General Manager Jonathan Crawford who gives us the describes their dealership as the following – “State of the art premise purpose built in 2007 on 12 acres, full length drive over pits, 40 bays, brake roller and shaker, full service dealership with engineering and fabrication, heavy mechanical repairs, engine and servicing. A driver lounge and accommodation, customer coffee bar and staff gym. And a large parts inventory, parts show room and large truck showroom”. When asked what is the highlight of the dealership, he replies “Full ground up restoration of a 1966 Seattle built Kenworth which is now housed in the Kenworth Dealer pavilion of the National Road Transport Hall of Fame. It was an original hard working truck that is now returned to full glory. Credit to our skilled and passionate workforce here at CMV. We are currently undertaking the same task on a 1981 W model. This year marks the 50th anniversary that CMV Truck Sales and Service has been a dealer. The completion of the W Model restoration will help commemorate this milestone”. Jonathan explains the unique thing about them is their people, “We have over 90 employees many of whom have over 20 years service and the longest serving being dad at 46! Several in their 30s and 40 years of service. Our team is close knit and work strongly together and endeavor to give the best customer service outcomes. We make every effort to ensure CMV is the best place to work with the way we treat our people, the facilities and internal promotion for long term careers”. What’s your favourite local spot? Anywhere out bush! We live in a beautiful state with great beaches, national parks, wine regions, horticultural, farming and pastoral areas. What’s your favourite truck model? Tough split between K100E and the W model! Diesel in veins, 4th generation in our 84 year old family business. If you weren’t working in this industry what would you be doing? Working as a ringer on a cattle station. My father Michael. Because of his integrity, patience, strategic thinking, genuine care for others, passion for our industry, our employees, our customers and our brands! Tell us about a project or accomplishment that you consider to the the most significant in your career. Our apprentice training and development program incorporating our in house training manager for apprentice mentoring but also orchestrating continuous technical training programs for all our staff. This improves staff engagement and leads to better customer service outcomes and is reflected in our Net Promotor Score (NPS). I can’t really call it an accomplishment because it is really a continuous improvement project! Is there a customer experience you are most proud of? Our staff provide solutions to our customers every day and we are proud to support them. It doesn’t always go according to plan but when our busy customers take the time to call or send a note in relation to some exceptional service they have received at one of our sites, that is when I am most proud. What are your thoughts on the future of the industry? We are very positive about the future of our industry. The national transport task is growing, nearly every single thing needs to be delivered by truck! Increasing road access for higher productivity vehicles is bringing greater efficiencies. We have the best brands, the best facilities, the best customers and the best staff – so the future is bright!